I don’t think I’ve ever been this excited for a Monday. Classes and finals are done, I’m just working my way through a pile of grading and by this time tomorrow, I’ll be on a plane, heading out to California. Honestly, I could be heading anywhere, I’m really excited to see M. It’s hard to believe it’s been over a month. Time flies when projects are everywhere. I’ve been working on super quick recipes recently, mainly because I haven’t had a lot of time in the kitchen. More projects keep coming my way and while I’m thankful to have the opportunities, it has left a major time crunch on my life. This omelette can be made with any greens. I used swiss chard but spinach, beet greens, or Asian greens would also work just as well. I’m also not a big fan of super wilted greens, but you can cook them as long (or as little) as you like! In an 8″ skillet, heat 1/2 tablespoon olive oil over medium-low heat. Mince garlic and add to skillet, cook for 1 minute. Remove tough stems from chard (if using) and chop greens. Add to skillet and cook until wilted to your desired consistency. Remove from skillet and set aside. Add remaining 1/2 tablespoon olive oil (you may need more, depending on skillet type). Whip eggs and add milk and salt. Continue to whisk until well incorporated. Pour into heated skillet and let cook. Lift up edges occasionally and swirl egg around. Once omelette is mainly set, flip and continue to cook for another minute or so. Remove from heat and sprinkle on goat cheese. Let sit for 30 seconds or so and then spread around. 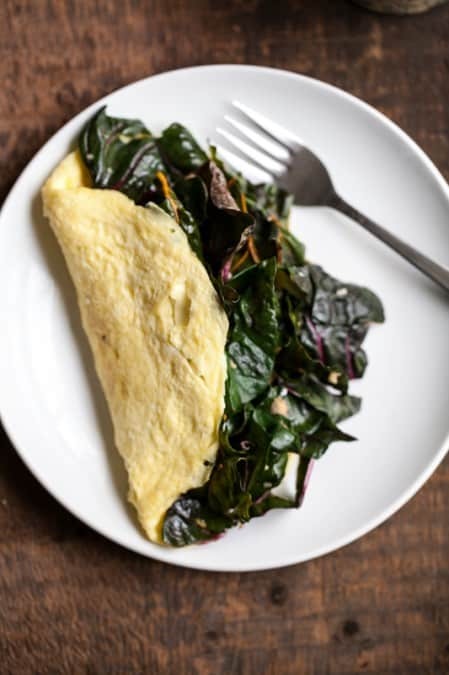 Transfer to a plate, add greens, and fold omelette over. Multiple recipe for each additional person. Looks and sounds AWESOME. I am all over garlic, and all over omelets. Great combo! 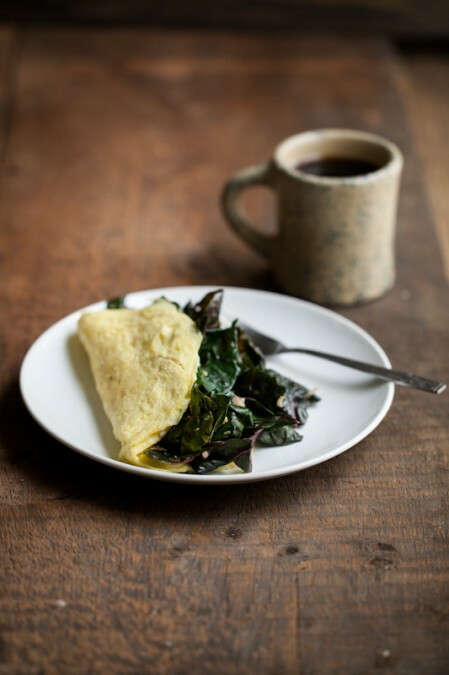 An omelet stuffed with greens and tangy cheese sounds just about perfect right now. 🙂 Have a good time in sunny CA! I don’t think you can ever have too many quick and tasty recipes in your repertoire! I love eating eggs and that’s one thing I can never get enough of! 🙂 Have fun in CA, it’s supper sunny now after the storm and rain for weeks long. Oh my! I want those garlicky (what a fun word) greens mixed togteher with some pasta and a good olive oil!! !